There are various search fields on SpecimenSearch under Identification and Taxonomy, and they query and return very different data. Identification queries the identification applied to specimens and includes the option to query previous identifications as well as the current identification. This field queries all taxonomy classifications and all classifications related to taxa attached to specimens. 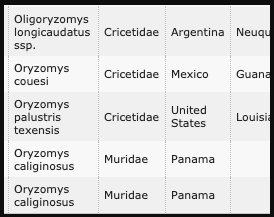 For example, querying MVZ Mammals for Muridae returns Euryoryzomys nitidus, even though MVZ’s preferred classification uses Cricetidae as the family of that name, because Freebase (accessed through GlobalNames) asserts that the unranked term “Muridae” is between “Muroidea” and “Sigmodontinae.” Results will take longer to return in this field because of the wider net it casts. 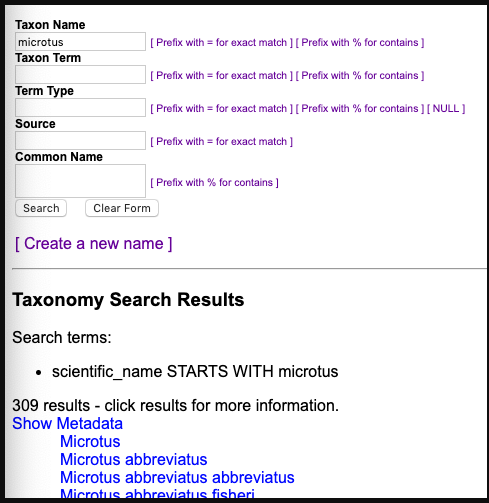 More specifically, a search can be conducted by entering the taxon name in the appropriate classification field. For example, whether a species is assigned to the family Muridae or Cricetidae may depend on what classification authority is selected by the collection. Searching at the family level may not return all the expected specimens. In this example, a search for the genus Oryzomys returned mostly records in the family Cricetidae. If we had searched for just the specimens of Oryzomys in Cricetidae, we would have missed two specimens in a collection that uses a classification with the family Muridae. If the two specimens classified in the family Muridae are in your collection, users may not find them depending on how they structure their search for the genus Oryzomys. 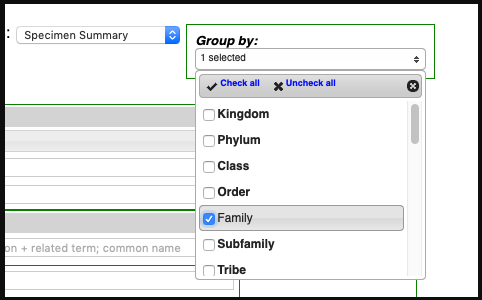 We can’t control which fields users will select to search for specimens, but keeping your taxonomy as complete and current as possible will help users to find your specimens. Each collection “claims” one taxon term source, and data from that source, when available, are stored with the specimen record. For example, CollectionX claims the COMPLETE classification source, which contains the following data for namestring “Sorex cinereus”. Users who search for “Mammalia” in the “Class” field from SpecimenSearch will find CollectionX specimens but will NOT find CollectionY specimens. 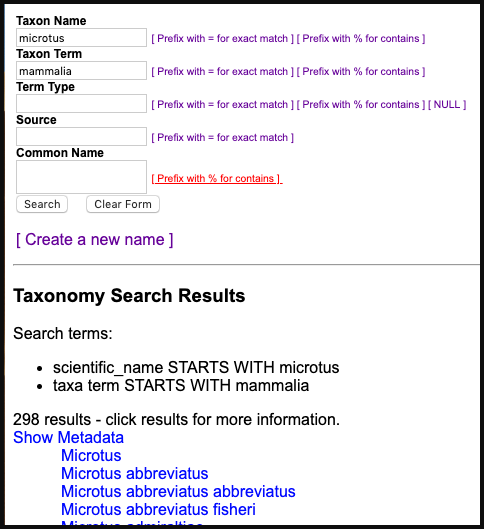 Searching the “Any taxon, ID” field will find specimens from both Collections X and Y. Since neither of CollectionX or Y uses this classification, searching the Family field for “Shrewidae” will find no specimens. But searching the “Any taxon, ID” field for Shrewidae will find Sorex cinereus from both collections, based on the assertions made by this unaccepted classification through GlobalNames. 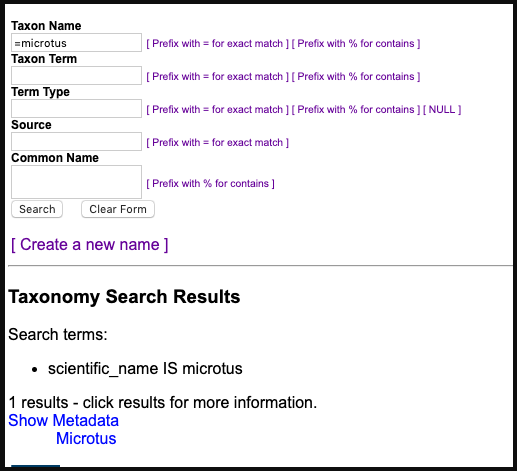 There are multiple ways to search for a taxon from the Search/Taxonomy screen and from there to specimens identified with that taxon. Each field returns different results and can be modified to be “exact” or “contain” the search string. Note values that pop into search form with these examples. One you have reached the taxon page, you can access the specimens identified with that taxon. You can request specimens with a current ID as Microtus or a previous (possibly unaccepted) identification of Microtus. Results can be limited to specimens with media and exact matches (in this case, specimens identified only to the genus Microtus). Note that if you are logged in with access to a specific collection, you will only see the results within your collection. Log out or create a separate profile without access to any collection to see results for all collections in Arctos. Collection1 and Collection2 both have specimens identified as Cymatium. Searching Identification for Cymatiidae will find nothing; the Identification is to a name (string), not a “taxon concept” (data object including metadata). Note that we can search for Cymatium under Identification (or Genus) and “See Results as” Specimen Summary by family. The results will show that Arctos has specimens identified as Cymatium in two families. This is an excellent way to check for taxon names with inconsistent higher classification. The taxon name is a hemihomonym used in both a vertebrate and an invertebrate collection or a plant and an animal collection. One collection has accepted a new taxonomic opinion, and the other hasn’t updated their classifications. One collection has accepted a controversial taxonomic hypothesis with which the other collection disagrees. One collection has confounded taxonomy and storage location and cannot update their classification until shelves are relabeled and specimens are moved. Note that the sums of the family-according-to-collection searches do NOT necessarily add up to the “family-according-to-someone” search total. A collection may use a classification that does not include a term ranked “family,” and doing so will return no specimens with queries which include family-according-to-collection.